The West of England Design Forum and D&AD are thrilled to welcome three award winning creative geniuses to our first ever joint event. We’re spending an evening with Ben Casey, Katja Thielen and Mark Bonner – seeing and hearing how their ideas have won awards and engaged people. Ben set up The Chase in Manchester in 1986 to offer a credible, regional alternative to London’s brightest and best design consultancies. Since then The Chase has earned an outstanding reputation for creative excellence. For the past decade it has been ranked in the top six places in Design Week Magazine’s Creative League Table and last year it made it to the number one spot. Ben is also a Professor at Uclan in Preston and despite winning and being invited to judge all the major creative awards he insists that his proudest achievement was when his students won 1st, 2nd and 3rd prizes in D&AD’s inaugural student competition. Alongside her deft creative touch and expert handling of clients, Katja’s hands-on leadership style includes the world-class dexterity with a bottle opener that reveals her origins as a winemaker’s daughter. After a decade at the helm of Together Design, she’s more passionate than ever about consumer brands and retail, and loves the challenge of developing emotional connections, crafting personality and creating new brands. Discover Yoosli to see it all come together. Mark co-founded multi-disciplinary graphics group GBH In 1999. Now a team of 20, GBH works internationally across disciplines solving communications problems for clients such as Apple, Puma, Royal Mail, Flos, Sennheiser, Starck Network, SBE Entertainment, Tretorn, Virgin Galactic and Yotel. GBH have consistently ranked within the UK’s top ten most creative design groups by awards won (DW Hot 100 Survey) since its foundation in 1999, reaching No 2 in 2007, and again in 2013. Mark won a D&AD Student Yellow Pencil in 1991 and a first Professional D&AD Yellow Pencil in 2005, with three more coming all at once in 2011. Mark has received nine D&AD Silver Nominations, six Design Week Award wins including Best of Show in 2003 and a Silver Award at the New York Art Directors Club in 2006 with New York One Show wins in 2004 and 2013 respectively. The pinnacle of creative achievement across the design, advertising and digital industries, D&AD is synonymous with outstanding craft and creative brilliance. It all started in the 1960s, when an elite group of British designers selected just 25 projects from over 2,500 entries to receive a special ebony pencil box designed by Marcello Minale and a place in the prestigious D&AD Annual. 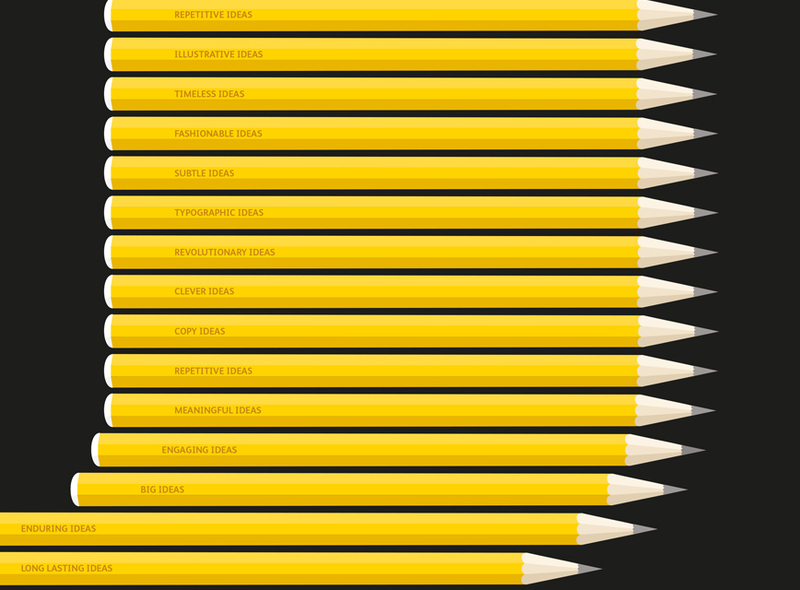 Over fifty years later, D&AD’s iconic Pencils are coveted the world over as the ultimate creative accolade. But today, D&AD is much more than just Awards. A not-for-profit organisation run by its members, all of D&AD’s surpluses from go straight into developing programmes and initiatives for the betterment of the global creative industry. Its New Blood talent programmes nurture and create opportunities for young creatives all over the world, while D&AD Foundation is dedicated to establishing industry best practice and campaigning help solve our toughest social and environmental issues.